comets are made out of dust and ice. Also comets orbit the sun. Also comets help by adding water vapor to the environment. 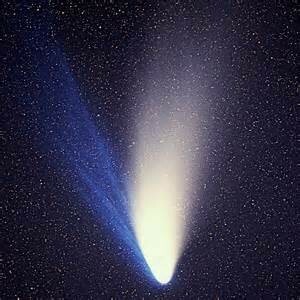 Comets are also in the area known as the Oort cloud, far beyond the orbit of Pluto. Nucleus: Frozen center of head and it is small. Coma: Rough blob of gas surrounds nucleus. The coma is made out of water vapor, carbon dioxide gas, ammonia, dust, and neutral gases. Iron tail: melted iron (liquid/gas). 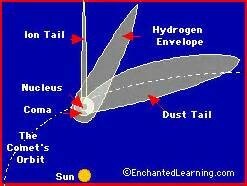 Dust tail: Fades away, also it is made out of dust. Hydrogen envelope: Hydrogen gas surrounds the coma of the comet and trails along for millions of miles. I have learned a lot about comets. 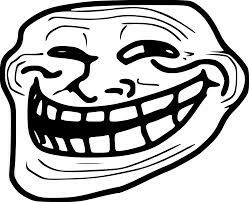 I learned parts of a comet, what they are made of and that they orbit the sun.